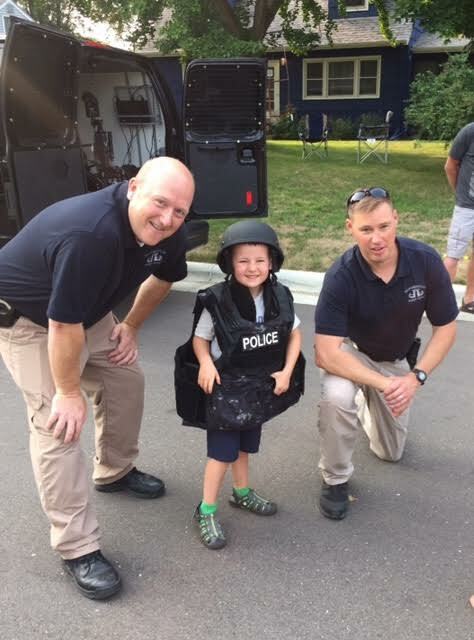 The youngsters were quite impressed with these very kind policemen visiting on National Night Out. 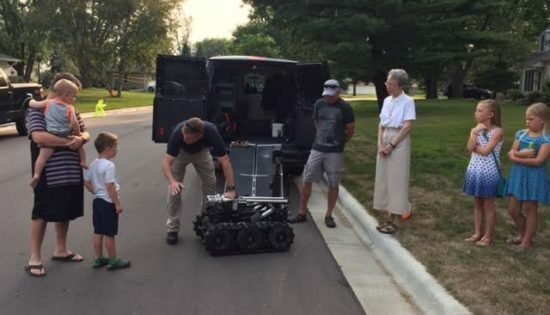 The guardians of the peace visited with their Robbie the robot. One of our youngest neighbors at National Night Out. Celebrating our sister Clare of Assisi in our time. Recently talking with people who have experience in real estate I learned about an acronym called “nimby,” Not In My Backyard. Hmm, that was interesting! And more recently I have learned about another acronym called “yimby,” Yes, in My Backyard.” many of the “Yimbys” people are from the New York, Seattle and San Francisco areas, not surprisingly, and are promoting building small affordable homes in urban areas that ordinary poor people can finance and so stop paying horrendous renting rates in the big cities, plus many other wonderful advantages for these poorer people living close together and supporting one another in an extended family atmosphere with the possibility of walking to work and schools with needed resources near-by. Google has just bought a huge piece of real estate in the middle of the city of San Jose where the techies can live and walk to work. How fine for them. And by the way, Silicon Valley was named in the 1800’s Santa Clara Valley. When the teckies take over the city of St. Francis what will they rename it? I have been thinking about Clare and her friend, St. Francis. As they began their Gospel project they both left Assisi. Francis had his brothers gather down the hill at the Portiuncula a little chapel in the woods. Later in the story that is where Francis and his brothers received Clare into the fraternity. Bishop Guido offered Clare and her small group of sisters San Damiano, a small chapel outside the walls of Assisi on the other side of the hill. In between the two communities was a leprosarium. I think that Francis and Clare would support the Yimbies. They were not running away from people but running to people, to be in proximity to the neediest people in their time.